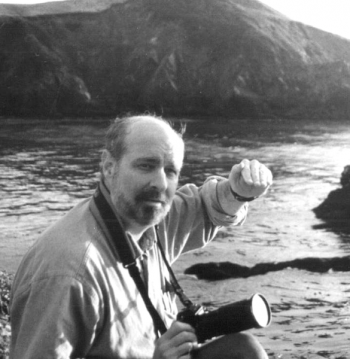 THIMGAN, David (1955-2003), a Southern California native, Thimgan attended public schools in San Bernardino and later enrolled at Cal State University. He became a modern maritime artist who specialized in re-creating scenes of America’s seafaring past with emphasis on the West Coast and Pacific Rim waterways. He was also interested in trade on the western rivers and the naval aspects of the American Civil War as well as the "Old Steam Navy." He painting professionally beginning in 1978, and was an Artist Member of the American Society of Marine Artists since 1981. His reputation as one of America's leading historical marine artists grew rapidly. His work appears in important private collections around the world, and major corporate collections including Goodyear and Security Pacific National Bank. Some of Thimgan's major exhibits include the Mystic lnternational, the Mystic Invitational and the American Society of Marine Artists National Exhibition. This oil on board work (right) is the artist's vision that shows the American 44 gun frigate Congress on patrol off Santa Cruz island in August of 1846 during the Mexican-American War. 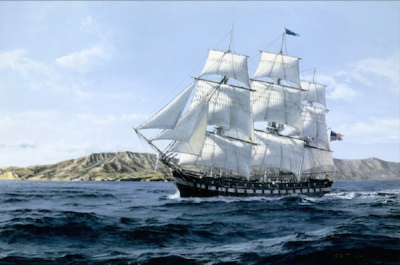 Congress was the last sailing frigate built by the United States. She was sunk by the Ironclad C.S.S. Virginia (ex-Merrimack) at Hampton Roads Virginia in 1862. This page was last edited on 29 April 2017, at 12:47.